Here's a photo of the day I to share from a few weeks back. All the leaves are down where I am we have had the cool weather set in so this is me, remembering warmer times. 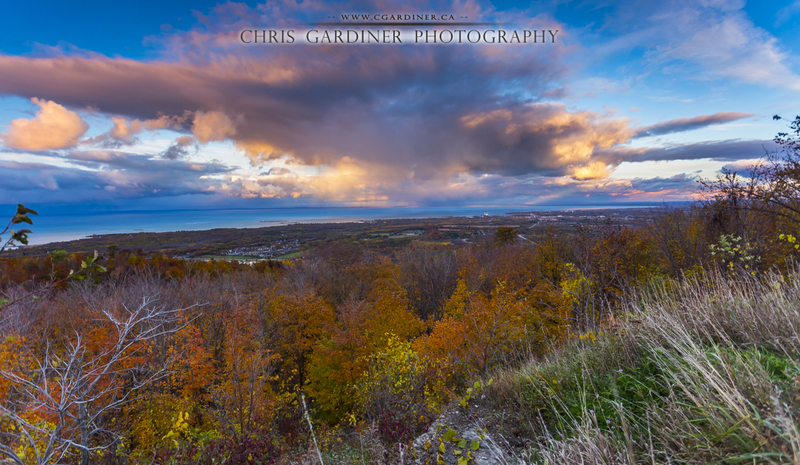 This one was shot one leisurely evening we went out sight seeing to take in the fall colours during their prime. We were out all day shooting photos and the sunset was just the icing on the cake for us. Read more to find out where it was captured and some of the shooting data. 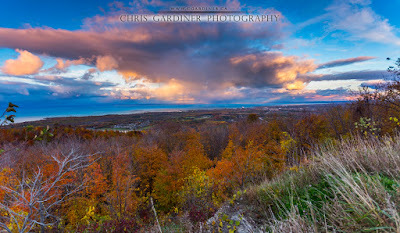 The sunset was shot from the top of Collingwood's "Blue Mountain" ski resort in Ontario on the shores of Georgian Bay. I have a nearly identical composition shot as a panorama of multiple frames, but sometimes simpler is better. It was captured on a Canon EOS 6D with an EF 17-40 f/4L, a circular polarizer, and a gradient neutral density filter. I captured quite a few up here. You'll notice this is one of those rare occasions where I have the setting sun at my back its lighting the clouds up in front of me. More often than not, its the other way around, and very rarely do I get the treat of what I can only describe as a full sunset wrap. Where the colour in the clouds seems to wrap around you in all directions. The sunset wasn't half bad behind me, there just wasn't anything I wanted to use for a foreground at the time - mostly roads, sidewalks, pathways kind of thing. until the next picture of the day!